Should you participate in this year's holiday marketing frenzy? 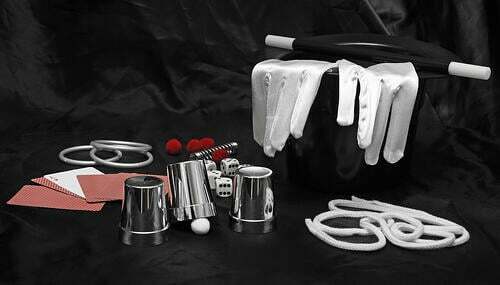 Will you be adding to the noise or will you be giving prospects something they actually want? The reality is twofold: The same people who don't want to be bombarded with holiday advertisements also want to receive notifications of good deals on products and services of interest. They also want to receive content that could potentially make their holidays a little more enjoyable. The good news? If you are practicing inbound marketing, your subscribers have already pre-qualified themselves as "interested in hearing from you." Which means you shouldn't feel the slightest bit awkward about reaching out to them come Thanksgiving! With that said, no matter how long you have been doing it, initiating communication with prospects can sometimes feel like a dating game. The key to hitting a home-run is knowing the sort of things that would truly delight your customers. In this article, we'll look at seven brands who deeply understand their target markets, as evidenced by their holiday marketing campaigns. As you read their ideas, ask yourself if any of them could successfully be re-positioned for your business. Is your company doing something especially unusual this Thanksgiving? If you are breaking industry norms in any way, your customers will definitely enjoy hearing about it. Retail giant, REI didn't just give their sales associates the day off on what is typically the busiest shopping day of the year, they created an entire social media campaign encouraging others to avoid the mall as well. 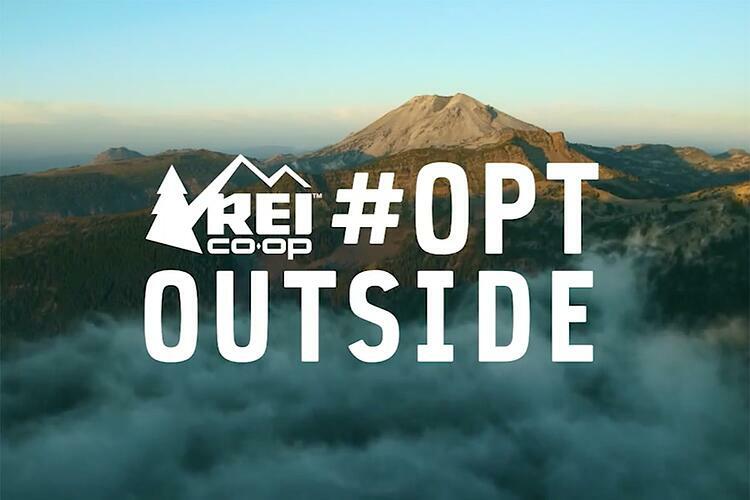 A month before Black Friday, the company sent an email inviting customers to #optoutside and say no to shopping. The campaign resulted in more than 1 million social media posts shared by customers detailing their experiences opting out. Good thing they didn't just send a boring email blast saying, "Hey, we're gonna be closed," right? The strategy was successful because REI knows their target audience is made up of trailblazers, rebels and outdoor enthusiasts -- not people who want to stand in line for 2 hours at the mall on a full stomach of turkey! REI used this knowledge to create a fun way for customers to interact with one another online, instead of bombarding their inboxes with predictable promotions. Could your business launch a similar holiday marketing campaign? Understandably, B2Bs often feel pigeonholed when it comes to content marketing. For example, a Big Data provider might assume they can only talk about NoSQL, or some other tech acronym, in their marketing material. Fortunately, this couldn't be further from the truth. International coworking space provider WeWork exemplified this with their #wwgiftguide campaign. 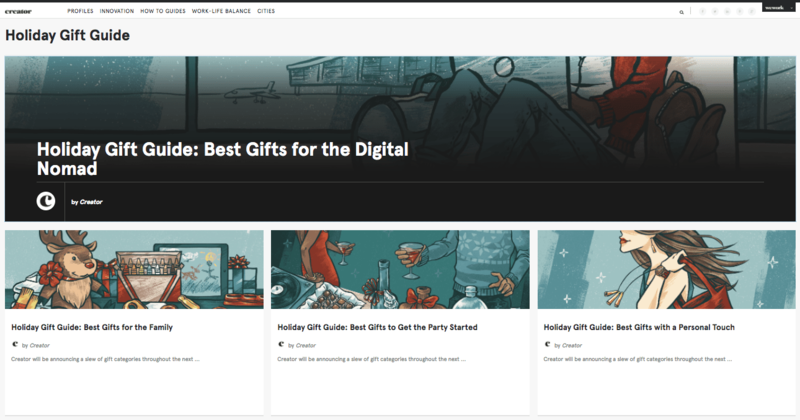 The company created a drip campaign, releasing several segments of "gift giving" content for its members, including Gifts With a Personal Touch; Gifts for Mentors; Gifts for The Family; and Gifts for The Digital Nomad. One of the most innovative aspects of the campaign was the inclusion of WeWork member companies within the content. The campaign was promoted across social media with the hashtag #wwgiftguide to encourage members to share what they planned to give over the holidays. WeWork's holiday marketing campaign proved companies don't have to limit themselves to discussing what people expect. While most everyone is eager to indulge in some stuffing, fewer are willing to roll up their sleeves in the kitchen! Cooking for the holidays can be stressful, especially if you are hosting extended family members. With that in mind, Choctaw Casinos & Resorts provided customers with the opportunity to win a completely prepared, home-delivered meal on Thanksgiving Day. The organization announced the contest via email blast to past hotel guests. Not only was the campaign a great way to remind patrons of their fond memories at Choctaw, it was also an opportunity to showcase the talents of Hotel Executive Chef David Goldwhite. We don't know anything about your target audience, but we're guessing they wouldn't mind a professionally prepared meal (we sure wouldn't). Instead of giving a turkey to one lucky customer, Third Man Records makes it easy for customers to give away thousands of food items to those in need. The company annually partners with the Nashville Rescue Mission, a nonprofit dedicated to feeding the hungry and homeless. The twist with this giveaway? Participants are encouraged to give in exchange for an incentive. After making their charitable donations, participants simply bring their receipts to the Third Man storefront in exchange for 10 percent off store purchases. They are also entered into a drawing to win a huge prize pack that includes exclusive vinyl and other "top secret stuff". Considering how many people want to do something philanthropic, but don't know where to start, it's not surprising this holiday marketing campaign delivers great results. And, again, people love winning prizes! No one likes traveling on Thanksgiving; they do it because they want to spend the holiday with the people they love. But you know what makes the long lines, delayed arrivals and crowded terminals more tolerable? Presents, of course. Zappos partnered with American Airlines to launch an innovative game, allowing travelers to win prizes. The day before Thanksgiving, 1,000 American Airlines passengers arriving in Houston were surprised with a "Wheel of Fortune" style game experience. As their bags were released onto conveyor belts, passengers were granted prizes depending upon where they landed. The campaign garnered national press coverage, 41 million social media impressions and a ton of good will among Zappos customers. Obviously, you need a big budget to pull this one off, but it's one of our favorites. Coca-Cola realized their Share a Coke service would pair perfectly with holiday gatherings. The service allows consumers to customize cans and bottles with names, personal messages, and other fun features. You can even now send friends and family members a personalized coke at a selected vending machine! 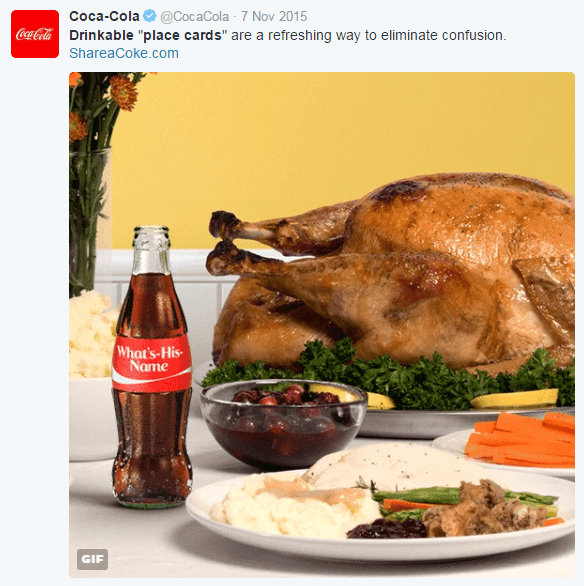 In celebration of Thanksgiving, Coca-Cola recommended using soda bottles with guest names as place cards. The clever idea was heavily promoted via Twitter Facebook and Instagram in the weeks before Thanksgiving. Though we don't have any data as to how much interaction the campaign catalyzed, we would venture to guess it was well received by loyal coke enthusiasts, party planners, and DIY’ers. Could your product or service easily be incorporated into a Thanksgiving celebration? People love hearing about new ways to enhance their holiday experiences. Did you know more than 350 million photos are uploaded to Facebook every day? One of the easiest ways to grow your email list, and increase your following, is to hold a photo sweepstakes. In exchange for entry into a cash drawing. 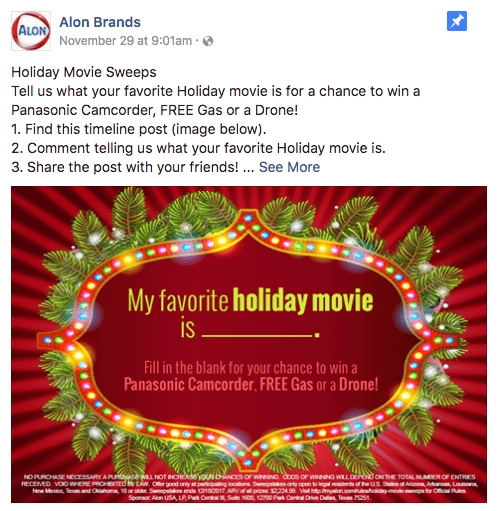 Gasoline supplier Alon invited followers to share pictures of their favorite Thanksgiving family memories for a chance to win one of several prizes. 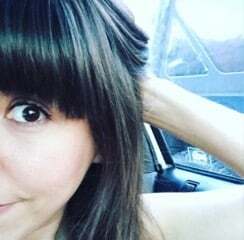 The contest proved so successful that Alon has decided to continue the tradition this year, asking participants to share whom they would invite to Thanksgiving dinner on Facebook. A friend, a famous person, the president, a cartoon character? The brand asks participants to share the post after commenting in exchange for entry. Prizes include an X-Box bundle, $250 worth of free gas and a drone. As of this writing, Alon's pinned Facebook post has generated more than 200 shares and nearly 300 comments. Your customers want to hear from you over Thanksgiving... If you have something of value to add their holiday experiences. The brands highlighted in this article range from little-known to global powerhouses. With that said, they all have one thing in common: They know their target audiences exceptionally well. At Lean Labs, we encourage our clients to go "above and beyond" when creating their Buyer Personas. It's not enough to simply know how much money someone makes or the kind of car they drive; you need to know what they value most, and how your brand fits into that picture. Get that right, and you will have no problem executing a successful holiday marketing campaign.